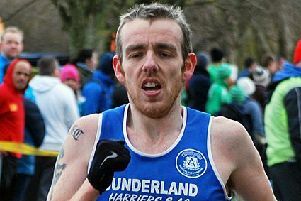 Sunderland Harrier Sam Thurlbeck, who made his debut. 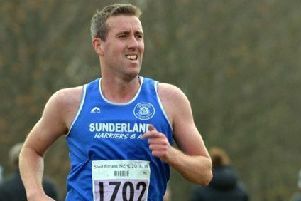 Sunderland Harriers moved up one place to third in the First Division of the Start Fitness North Eastern Harrier League at Thornley Hall Farm on Saturday. This was a venue for the real “Toughs of the Track” with a farmland course consisting of rough pastures, a ploughed field and a mountain of a hill to negotiate. But the Wearsiders ploughed on to place their six counters inside the first 71 finishers to score 150 points to take third place behind winners Morpeth (74) and Elvet Striders (130). It was the inform Michael Barker, in sixth place, who led the club home, running from the medium pack of the six-mile handicap race. His time of 35.36 put him among the fastest times of the day in 12th position to consolidate his improved form of late. Next across the line was debut boy Sam Thurlbeck, running from the slow pack and finishing in 38th (41.18), then came medium man Graeme Pullan in 50th (39.19), followed by slow packers Darren Stoker in 54th (41.52), Paul Redman 56th (41.54) and Steve Rankin from the mediums in 71st (29.34). Sunderland Strollers finished fifth team in Division Two with Raymond Christie, running from the slow pack, their leading man in 19th (40.28). Houghton Harriers took sixth place in Division Three and they had fast pack man Lee Dover in 26th (35.47) and mediums Rory Graham in 33rd (38.41). The race winner was Morpeth’s new recruit from Tynedale, Adam Pratt, who clocked 35.21. The fastest on the course was a guest runner from Bristol and West AC, Jarlath McKenna (33.01). Sunderland Harriers women’s team are finding it tough going in their first year in the First Division. They have slipped from sixth to eighth and only one place off relegation. It looks like it is a three horse race to see who joins Alnwick for the drop with Tyne Bridge, Sunderland and South Shields, all vulnerable. Sunderland’s counters in the team that finished eighth were Alice Smith, from the fast pack, who took 21st (28.34), Nikki Woodward also fasts was 48th (29.32), Nicole Hufton (mediums) 51st (32.01) and from the slows Maria Davis took 133rd (36.35). Guest athlete Stephanie Lawrie from Victoria Park Harriers Glasgow, won the race in 27.42. Morpeth’s Emma Holt was the quickest on the course (25.36). Sunderland had a medallist in the Under-17 Girls’ race in Grace Mackie and Isabel Maher was sixth Under-11s. Houghton Harriers had second Under-17 team with Anna Pigford sixth, Eva Hardie seventh and Lily Hardie 20th. The Under-13s Girls team were fourth with Amy Leonard fifth, Tilly Abbott 12th and Anna Whelan 21st . Amy Leonard was seventh and Nicole Phillips ninth in the Under-15s Girls. Brandon Pye was runner-up in the Under-13 Boys Race.